It is no secret that truck drivers are not all that thrilled about having to do work that doesn’t keep the wheels turning. They are not getting paid for the time it takes to load a trailer, secure the load, and cover it with tarps. They only get paid while the truck is in motion. So it should be obvious that efficiency outside the truck is key to making money. The most efficient truck drivers limit the amount of time they spend doing things other than driving. The more efficient a trucker is, the more miles he or she can cover in a given day. It is with this in mind that we want to offer a few suggestions for increasing efficiency outside the truck. We are fortunate enough to be part of an industry that continues to evolve. We are seeing all sorts of new tools entering the market every year, including the revolutionary ratchet winch bar. This tool takes the basic concept of a winch bar and makes it even better by combining it with the ratchet. A ratchet winch bar works just like a ratchet wrench. Pulling up resets the bar; pushing down creates the force necessary to tension winch straps. Just reverse the action to use the ratchet winch to safely release straps on the other end. All the best tools offer only limited efficiency if you don’t know how to use them. So with every new tool you buy, make the effort to learn the best ways to use it. Read owner’s manuals; watch videos online; ask other drivers about their own experiences. A good example of this principle is using the winch winder. The winch winder is a tool that reduces the time it takes to wind your winch straps after unloading. Using it is a lot faster than manual winding. But beware, you can create bigger problems for yourself if you’re careless. There is a right and wrong way to use the winch winder. Use it the right way and you will also increase your efficiency. One of the worst things a truck driver can do is jump right into securing a load without thinking things through. Time tends to be a major factor which could make a driver attack cargo control without giving ample thought to what he/she is doing. It takes a minute or two to logically think through the best way to secure and cover a load. The few minutes it takes could save you a lot more time by giving you the opportunity to plan what it is you’re going to do before you start doing it. Last but not least, eliminate every unnecessary step from your work. Whether you are working with a ratchet winch bar, a winch winder, or heavy chains, there is no point in creating extra work for yourself. Let’s use tarping as an example. As long as the conditions are right, don’t unfold a tarp on the ground. Put it on top of the load and unfold it as you go. This eliminates the unnecessary step of having to haul the tarp over the load after unfolding in on the ground. Unfolding from the top of the load is far more efficient. Increased efficiency reduces the amount of time a trucker spends outside of the truck. It should be every truck driver’s goal to be as efficient as possible, so that more time is spent driving. The flatbed trailer side kit is one of those products truckers are not sure if they really need. Technically speaking, a side kit is really not necessary to make a living as a flatbed trucker. But owning one does increase your job opportunities. Some shippers expect their loads to be secured in specific ways, and sometimes that means using a side kit. If you are new to the flatbed game, a side kit is essentially an on-demand enclosure that can completely cover a load from top to bottom much the same way a dry van does. The advantage of the side kit is that it can be installed and removed as needed. Use it when you need it; keep it stored when you don’t. Agricultural products that will not be damaged under their own weight usually don’t have to be pack too carefully for transport. All the truck driver really needs to do is protect the crop against moisture, sunlight, and road debris. The side kit is perfect for this. We are talking about crops like corn, watermelon, and soybeans, by the way. Along those same lines, there are agricultural products normally transported in crates that can also be handled with a flatbed and side kit. The advantage of the side kit is that the product can be loaded directly onto the trailer without first having to create it. A side kit makes the job faster and more efficient. The majority of flatbed truckers transport industrial machinery just by securing it in place and throwing tarps over it. But as you may already know, industrial machinery comes in all sorts of odd shapes and sizes that do not necessarily make standard tarping easy. Some pieces can be downright impossible to keep completely covered just with tarps alone. A side kit completely encloses already secured machinery. There are no worries of tarps flying off en route. There are no concerns over damaging tarps on sharp edges. There is no need to use edge protectors and other peripheral equipment normally used in the tarping process. As wonderful as truck tarps are, they cannot always keep out the weather entirely. Loads extra sensitive to precipitation and sun might be better off enclosed by a side kit rather than covered only in tarps. Loads could be anything from designer building materials to sensitive manufacturing equipment. If there is a need to take special precautions against moisture and sun, a side kit is usually a better option than tarps alone. Similar to weather sensitive loads are those sensitive to the wind. We are talking about loads that are unusually light, loads that can easily be tossed about at highway speeds if wind were allowed to get underneath them. It might be a lot easier in such cases for the truck driver to install a side kit rather than having to go to great lengths to make sure there is no possibility of wind getting between tarp and load. Side kits do take some time to install and remove, so they are not ideal for every job. But some jobs require an extra level of protection that tarps alone do not offer. These are the kinds of jobs that are ideal for side kits. If you are a flatbed trucker and you do not own one, now is the time to get one. A side kit will give you more opportunities to find work and make money. You see a lot of interesting things traveling down the interstate. For example, flatbed trailers carrying all kinds of loads are commonplace. Some of those trailers looked to be carrying pretty impressive cargo, though you might never know what it is hidden under all those tarps. That leads to the following question: how do truck drivers get those tarps fitted so tight? Covering a load with truck tarps is not as easy as it sounds. Anyone can throw a couple of tarps over the top of a load and secure them with bungee straps, but that does not mean the cargo underneath is safe from all that could potentially harm it. That’s why truck drivers go to such great lengths to guarantee their tarps are tightly secured. They do not want their tarps flapping in the breeze at 60 mph. So, how do they do it? It is a combination of a number of things. First and foremost, there is no substitute for experience. Every truck driver learns on the job regardless of how much training he or she received in CDL school. Simply put, learning the best ways to deploy truck tarps for any given load is a matter of book knowledge, time, and plenty of time actually doing it. Imagine hauling an oddly shaped load consisting of industrial machinery and supplies. You might get it wrong the first time out, failing to get your tarps tight and secure. Rest assured you would hear about it on delivery. Whatever mistakes you made that first time are unlikely to be repeated the next time. You will find a better way to do it on the next run. Load after load, you’ll get better at tarping. The laws of physics are a wonderful thing in that they can be learned through simple observation. 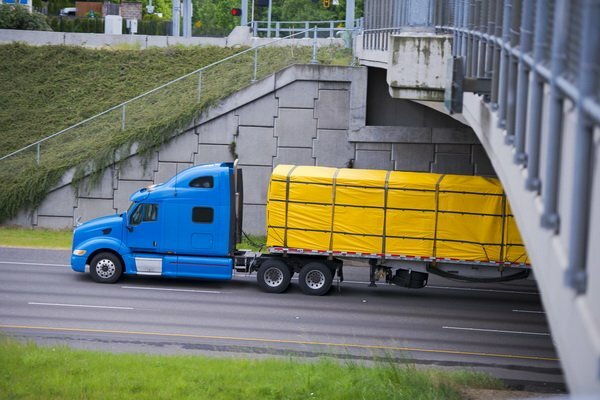 A truck driver may not have taken high school or college physics prior to beginning his or her career but watching how loads and tarps respond during travel can make any truck driver a physics expert in no time at all. Truck drivers with the best tarping skills are the same drivers who pay attention to the smallest of details. They pay close attention to how each load is tarped and then, during transport, how the load and its tarps respond. They pay attention to tarp movement at highway speeds; they pay attention to how tarps handle bad weather; they pay attention to how temperature extremes affect their tarps. Finally, the smart truck driver doesn’t turn away any advice offered by others. No trucker lives on an island, and no trucker knows everything about tarping. So receiving and offering sound advice is in the truck driver’s best interests. Drivers get advice from other truckers, from shippers, and even from police officers and DOT inspectors. Imagine being at a roadside inspection when a state trooper notices one of your tarps isn’t as tight as it could be. If that trooper offers a word of advice based on his past observations, how would you respond? Smart truckers take the advice for what it is. If it is usable, great. If not, it is dismissed. No harm, no foul. Next time you drive down the interstate and see a flatbed trailer with a tightly tarped load, don’t assume that the deploying of the tarps was an easy task. Truck drivers put a lot of work into securing their loads prior to departure. If you observe an exceptionally good tarping job, be confident that driver knows what he or she is doing. Vinyl tends to be the material of choice for truckers in need of new tarps. It is an ideal material for flatbed truck tarps because it is lightweight, rugged, and extremely flexible. However, there are times when vinyl might not be the tarp of choice. These are times when truckers need canvas tarps. The good news is that Mytee Products carries a selection of canvas tarps to suit every driver’s needs. Canvas tarps are ideal for certain kinds of loads because they are breathable and less abrasive. Experienced flatbed truckers will keep at least a few on board at all times. The objective of this post is to familiarize you with some of the key aspects of canvas tarps so that you are better informed when it comes time to buy. Like vinyl flatbed truck tarps, canvas tarps come in various grades from light to heavy duty. Heavy-duty canvas tarps are ideal for industrial environments where loads can be exposed to harsh conditions, including certain kinds of chemicals and extremes of either hot or cold. Heavy-duty canvas is usually not something the average trucker needs, but it is out there for those who want it. When you look at the canvas tarps in our inventory, you will notice that they are water-resistant. After manufacture, the material is coated with wax to help repel moisture. However, the material is not 100% waterproof. This is by design. The whole point of using canvas is that it is a breathable material. If it’s made waterproof, it loses much of that breathability. If you absolutely do need a waterproof canvas tarp, they can be specially ordered. This third point may be the most important of the five: canvas is intended to complement vinyl, not replace it. In simple terms, the average flatbed trucker needs a complete selection of vinyl flatbed truck tarps to be able to cover just about any kind of load. Canvas is a material that is not suitable in all situations. So it’s a good idea to have a few canvas tarps on board for when you need them, but maintain a larger selection of vinyl tarps for most work. Canvas is not the primary material choice for truck tarps because it requires a bit more care than vinyl. Let’s face it; every flatbed truck driver knows he or she doesn’t have to pamper his/her vinyl tarps to keep them in good condition. Vinyl can withstand a lot of punishment. Canvas, though, is another matter. Canvas tarps are easier to tear and are more prone to mold growth. So while you don’t have to handle them with white gloves, you do have to be more deliberate about applying a canvas tarp and be very careful to make sure it’s completely dry prior to folding. The most common load hauled with a canvas tarp is an equipment load. Canvas is an ideal material for hauling construction and farm equipment, industrial equipment, and the like. Canvas is also flame-retardant. This makes it a safer option in some environments where combustible materials are in proximity. Every independent trucker should have at least a few canvas flatbed truck tarps in the toolbox. You never know when a load calling for canvas will come up. Having a few on board means that the trucker will always be ready to go when any such loads are available.